Medical ultrasound technology uses high-frequency sound waves to produce detailed images that help physicians diagnose conditions affecting the body’s organs and soft tissues. What if this technology could also be used to help treat the problem? Diane Dalecki ’83, ’85 (MS), ’93 (PhD), director of the Rochester Center of Ultrasound, has already asked the question, and she is currently working on the answer. Dalecki’s lab, which is dedicated to advancing the use of ultrasound in medicine and biology, is developing ultrasound-based technologies for tissue engineering and regenerative medicine. The ultimate goal: have the ability to fabricate living, functional artificial tissues and organs. Tissue engineering and regenerative medicine are just a part of an impressive list of work that led to Dalecki being named the University’s Distinguished Professor of Biomedical Engineering. The distinguished professorship was established by the University through royalties from the Blue Noise Mask. Invented by Kevin Parker, Ph.D., the William F. May Professor in Engineering, and Theophano Mitsa ’88 (MS), ’91 (PhD), the Blue Noise Mask is a widely adopted halftoning technique that prints shades of gray in less time and at a higher quality than traditional methods. It is a patented process that has been licensed worldwide by more than a dozen companies, including Hewlett-Packard, one of the world’s largest computer printer manufacturers. The royalties have funded four other endowed distinguished professorships and provided support for research and scholarships. 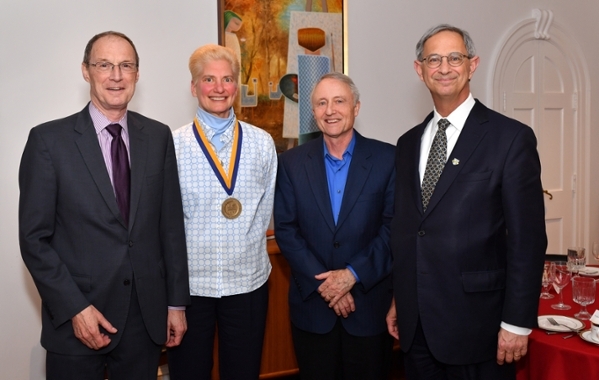 Dalecki has been a recipient of the Goergen Award for Excellence and Artistry in Undergraduate Education and is a three-time recipient of the Undergraduate Engineering and Applied Sciences Professor of the Year Award. For information on how to support Diane Dalecki’s work or research being conducted in another area, contact Eric Brandt at ebrandt@alumni.rochester.edu or 585-273-5901.